What do you need to know about screen time and kids? If there’s something all of us are or will face as parents, it’s screens. There are varying thoughts around screen time, as well as plentiful data and certainly no shortage of opinion. This post is NOT about what you should do, it’s about engaging you in a thoughtful contemplation about what you will choose to do regarding screens and family life. After sharing information and links to recent research, I share specific steps you can take to decide what media use fits best for your household. What is known about screens today? Technological changes happen with such rapidity that there new information often emerges while we’re still digesting yesterday’s “news.” That being said, scores of studies have been and are being conducted on screens and how using them affects our children and the rest of us. When thinking of screens or media, it’s not one homogeneous category. 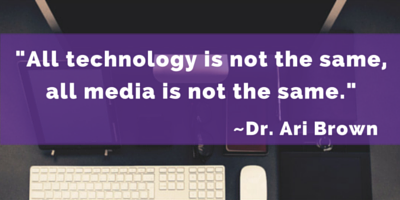 As Dr. Brown noted, “There’s consumption, and there’s creation, and there’s communication.” The effects of media vary based on the purpose for which screens are being used. No screen time isn’t a reasonable (or likely achievable) goal for most families. Screens are a part of our lives and so our choices center around how, when, why we’ll actively choose to access them. To make these choices, parents need to be mindful. Beyond the “yes” or “no” question are issues of appropriateness for a child’s age and level of development. The focus of the NYT article is that media use impairs children’s development. Specifically my favorite parts of the article are reminders about the model parents are setting with our own behavior. “Some parents are perpetually tuned into their own devices, responding to every ping of their cellphones and tablets. . . . Other parents fail to establish and enforce appropriate rules for media engagement by their children,” writes Jane Brody, the article’s author. As I wrote at the start, I’m not here to tell you what you should do (I’m not that kind of coach). Instead I’d like to offer several strategies for coming up with practices that work for your family. Get clear on what you want to cultivate in your family and your children and consider how screens can support these goals and how they can hinder them. Are you aiming for creativity, freedom, physical vitality, and passion, for instance? Great! If you want freedom for your child, then your choosing to “control” media use may actually work against your bigger goal. If you’re a solo parent working two jobs and you have a goal of freedom for yourself, allowing your child to use media at certain times make give you a brief respite for your own well-being. There is not one universally-right answer, nor may there be a plan that works for your family at all times, under all conditions. The goal here is to get mindful and avoid the knee-jerk reactions that often come up for us when we believe the stakes are high. Consider what you want associations you want your child to make with screens. One of my favorite articles to provoke deep thinking about screens is titled The Sliver, or how to stop fighting about screen time (thanks Susan for bringing it to my attention). Here is one of my favorite quotes from the article: “And when you limit what your child wants to do and push them toward something else, saying THIS is better than THAT, you create conflict where there doesn’t need to be conflict. They should be able to love books *and* TV, computer games *and* playing outside. But because you have put these things in competition with one another, they have to choose — so they end up rejecting the very things you want them to embrace.” I have wonderful memories that involve movie screens (very old-school, I know 🙂 ): seeing an amazing mystery world unfold at the Star Wars premier, sharing my first “real” kiss during Romancing the Stone, learning that all people are worthy of love, honor, and respect thanks to Free to Be…You and Me (TV). 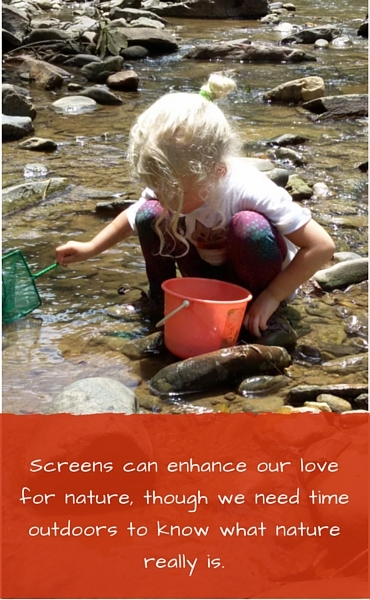 Take some time to think of what positive connections you want to build that involve screens. This act in and of itself may significantly reduce the stress you feel around this issue. Pay attention to the model you set and what it communicates. Yes, many of us use screens extensively in our work and beyond. For some of us, spending lots of time with devices may be how we earn our livelihood. Nonetheless, one of the biggest impacts of media on our children is what they learn about it by observing us. Do you escape with screens or connect with them? Do you use them by yourself or with other live humans? Do screens control you or are you in control of them? Are devices with you constantly or do you leave them behind/off when you’re having family time? Have the courage to ask yourself these questions, not to judge or shame yourself but simply to have an accurate picture of the model you present. If you feel uncomfortable with what you discover, make changes to move to a different way of relating with the screens and people in your life (and maybe even life itself). Know what is happening with the media in use. In our family new media exposure involves a parent (ideally, either before our daughter watches/uses, or at least or watching/using with her the first time). We also read app reviews before adding things to the Kindle and have parental controls that prevent her from making purchases (or accessing content) on her own. For me personally, this is an area of control that I like. I don’t want my daughter exposed to certain things which is why I practice Simplicity Parenting principles of limiting adult conversations and mindfully considering exposure to all media. My personal opinion: If you’re not comfortable with a show/game/app your child is interested in, do one or both of these things depending on their age and the general relationship you’ve built with them: (1) talk with them about why they like it, what it means to them, how they want to use it and/or (2) say “no” for now (you can revise later) and help come up with alternatives. Finally, even once you’re comfortable with a certain media, check in from time to time (watch another episode to see if the tone is the same as the sample you first “approved”) and also talk about the media with your child (e.g., So, what’s your favorite part of playing minecraft? What happened with Daniel Tiger today?). Observe the effects of screens on your family and adjust. As a coach and parent I’m a huge fan of experiments. It’s true that no outsider can be an expert on you. It’s also true that we’re not infallible experts when it comes to our children. What each of us can do, however, is put things into practice in our own lives and study the results. In my own family, for instance we’ve experimented with boundaries but no time limits (e.g., boundary of no screens before school or after dinner), boundaries and time limits combined, content limits (e.g., fewer videos, more interactive apps). You get the picture. What I notice is that when media time goes up, it means that my husband and I are busier and are focusing more on stuff (to do lists, work, our own goals) than on relationships. Basically during such times we are counting on media to be our stand ins for our daughter. Sometimes, this is acceptable to me–I do have work to do and sometimes a screen is the most effective way for my daughter to stay occupied and allow me to focus. But overall, I’m not on board with substituting things for people AND when this happens too frequently or too much, I notice that the quality of our connection as a family suffers. We laugh less, tell fewer stories, play fewer games, and miss everyday moments of magic. If you’d like to talk about screen time or another issue that’s impacting the quality of your family life, I’d love to connect. Book a free Illumination Session to reserve your own one-on-one coaching time. Shonnie Lavender inspires and empowers conscious parents to create connected, respectful, and thriving families by eliminating fear-based parenting methods still commonly in use today. A contributor to Huffington Post and Elephant Journal, Shonnie has appeared on numerous podcasts and radio. Professionally she holds a Masters Degree, did her coach training at CoachU, and received her coaching accreditation through the International Coach Federation. You can find Shonnie on YouTube, Facebook, and Instagram.